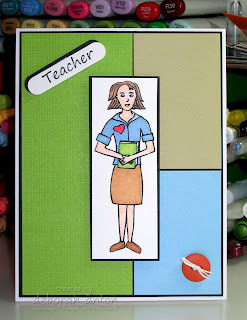 Thank you Teacher- A new set by Carolyn King to Win!! Teacher Appreciation here for my kids is next week. I hold a special place in my heart for them... they have such a tough job and it often goes so unappreciative; and often underpaid. They spend more hours with your children daily than you do on school days and if they have their own children at home, then they have to go home to tend to their own family! What a job!! I once took the Myers-Briggs test and it stated that one of the jobs that fits my personality was to be a school teacher. I just don't think I can do it! I mean, I love my children, but to spend hours on days with many more of them, that is too much!! LOL!! I think I could substitute (maybe that is worse??!) but not do it everyday. The principal at my children's school has a PhD in education and has been doing this for over 40 years!! I applaud him for that! He truly loves what he does to spend every day with small children-but he also has a great outlook about them. So in honor of them, I have made a card with Carolyn King's new set by Gina K called Nurse Feelgood. This set compliments last years set of Dr. Feelgood, but with this one, it is quite versatile! You can change it around to be a teacher, vet, nurse, PA, etc. It is a great set so head over to Gina K and check it out!! And because I support my good friend so much, you will have a chance to win this set!! Just leave a comment and a random name will be chosen May 4th!! For this card, I used scraps for the pieced bg with a pop of black. The main image was colored using Copics and is popped up. I added a little button for an embellishment and the sentiment was punched out using the WW SU! punch and popped up as well. A simple and quick card!! Thanks so much for stopping by and taking a peek! I know we are all so busy! Exciting news and a card! I used Regal Rose for the base color and punched the bottom part of the card with my scallop border punch. I stamped around the card with the same main image stamp in Regal Rose, sponged it with the same color, and sponged on top of that with Close to Cocoa. The center panel I used Kraft cs sponged with Close to Cocoa and white cs on top. I tore around the white panel and sponged that with So Saffron and Close to Cocoa. 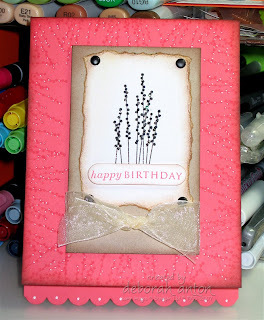 The image was stamped and I added black stickles for sparkle and black brads on the corners. I popped up the sentiment and main image and finished it off with a ribbon! The exciting news??? I have been accepted to join the Amate Studios Design Team!! I am so excited as I will be able to use both my hobbies into one! Keep checking back as there will be some designs soon using products from Amate Studios and others!! Happy Earth Day to everyone!! 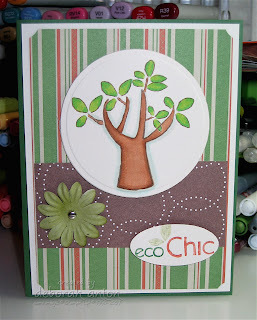 I thought I would make a card using my Unity Stamps set of Eco Chic for this occasion. It is a fun set! I stamped the image and colored it in using Copics. The circle was cut and embossed with Nestibilities and then popped up. The sentiment was punched out using SU! oval punch, popped up and a Prima flower for the final touch. The main panel was also up on dimensionals. 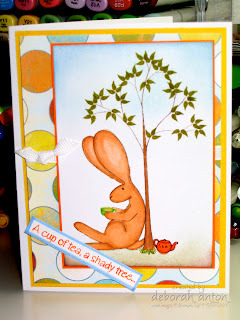 This is was a quick and simple card which was perfect for my day today!! Thanks so much for stopping by! I know you are all so busy!! It is appreciated! This set is from MFT called Hangin with my Peeps. I just love the title and the sentiments that come with this set. I colored in the main image with Copics and sponged in the ground and grass. The little chick on the ground is one I colored, cut out, and popped up. I wanted a simple card to send for the holidays and this was exactly that which only took 10 minutes to make. (Add this to your 10 minute cards!) I cut out the card base to be the normal card size of 4.25x5.5. I then made the actual card to be 4x5.25. I adhered the card to the base. I then embossed the main panel using SU! exclusive embossing folder of Manhatten Flowers. I lightly sponged over the image for some darker contrasts and stamped the Easter Wishes. For the finishing touch, I added two small crystals. That's it! You can add some sheer ribbon to the center panel if you like for another look, which I also did, and that adds a nice touch. Isn't this image just the sweetest?? I fell in love with it the moment I saw it! I love tea and it is always better shared with someone to chat with! This image is from MFT and the bunny is Flopsey. Head over to check out all the Flopsey images... you won't be disappointed. MFT just released its April sets and they are all darling! I can't wait to get my inky fingers on them!! LOL!! For this card, I used Basic Grey's Cupcake line of dp and colored in the image with Copics. I then sponged in the ground and sky to for some added color and finished it off with ribbon. Both main panel are popped up for dimension. Thanks for stopping by and taking a peek!! I got to play along the MFT Guest Designer Spot Inspiration Challenge today. The colors were great! Bright and cheery! For the bg of various colors, I used glossy white paper and Tim Holtz's Distress inks using direct ink to paper. Once dried, I stamped the main image of Heres the Scoop and colored that in with Copics and added fun flock to the flowers of chair for some texture. The main panel and image panel are popped up. I used the sentiment from MFT's Twisted Sentiment Two and finished it off with a Prima flower, ribbon, and stickles for a little sparkle!